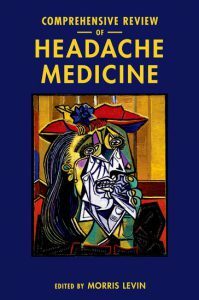 This book, with chapters written by the board and members of the Headache Cooperative of New England, can be ordered on Oxford University Press’s website, Neurology section. Two reviews are excerpted below, followed by an outline of the book’s contents. The book is divided into sections similar to those outlined by the UCNS in their curriculum for Headache Medicine (HM) training as well as the summary of topics covered in HM Board examinations. Part I deals with the anatomy, physiology, pathophysiology and epidemiology of the headache disorders. Part 2 covers classification and diagnosis in the primary headaches. Part 3 discusses diagnosis of non-primary headaches. Part 4 deals with treatment of primary headache types, and Part 5 contains information about treating special populations and treatments that are advanced or specialized. The HCNE Comprehensive Review of Headache Medicine contains chapters written by diplomates of the UCNS Headache Medicine Board, and is ideal for any clinicians interested in furthering their knowledge of Headache Medicine.